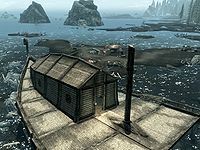 Orphan's Tear is a shipwreck occupied by three bandits, located far northwest of Solitude on the northern coast. The ship had been split into two sections; one section is partially submerged and holds the cabin, while the other is almost fully submerged. There are three bandits based here, who will become hostile and attack as soon as you approach. There is a melee fighter, an archer, and a magic user. Once they are taken care of, you can proceed with exploring the shipwreck. 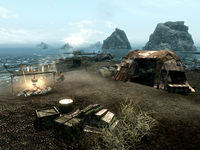 The bandits' campsite on the shore consists of a campfire and a large tent with two bed rolls and a table holding some cheese wedges and a wheel, and an adept-locked chest containing random leveled loot just outside the tent. Near the tent, there are four salmon hanging from a rack and a bucket containing three more salmon behind a small boat, all of which can be harvested. Beside the bucket of salmon are some crates with two bottles of Nord mead. There is also a woodcutter's axe lying on a wooden block in front of the large tent. Inside the shipwreck's cabin, you will see a table propped up against the wall with an unlocked chest hidden behind it. Also, if you look hard enough, you can find two bottles of skooma and a potion of minor magicka beside the bed roll. There are a couple of barrels on this level containing foodstuffs. Proceed down the stairs into the water to find several barrels containing common food and also a pair of iron boots near a bed. If you proceed further down one level you will see a skeleton trapped underwater to the left of the stairs, along with another unlocked chest surrounded by four barrels. To the right of the stairs is a potion of magicka. There are two harvestable clams between the two parts of the boat and two spiky grass plants next to the large tent. The other submerged section of the shipwreck does not have any notable loot however, other than a few barrels. There is a total of 45 Nordic barnacle clusters in the area, where you can harvest Nordic barnacles. There is an iron ore vein to the southeast of the campsite. This page was last modified on 26 December 2015, at 14:46.